More than 200 students from Whitworth, Gonzaga, Eastern Washington, Washington State and Spokane Community College, representing a number of academic disciplines, will present their original research April 16 during the Spokane Intercollegiate Research Conference at Whitworth University. Also in attendance will be several students from North Central High School, who by special invitation will present their genomics research. This will be the largest SIRC gathering in the conference's nine-year history. The conference is open to the public and will take place Saturday, April 16, from 8:30 a.m.-5:30 p.m., in Whitworth's Weyerhaeuser and Dixon halls. During the conference, students will give oral and poster presentations based on research conducted in disciplines including athletic training, biology, business, chemistry, health science, nursing, communications, computer science, criminal justice, economics, math, engineering, education, English, modern languages, history, physics, political science, psychology, sociology, theatre and theology. 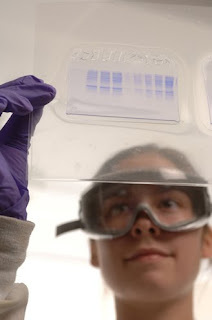 Each of the students has been mentored by a faculty scholar; some of the students have been participating in faculty research projects funded by outside grants. The Spokane Intercollegiate Research Conference provides an opportunity for students to do what their professors and other academics do as an integral part of their jobs: conduct original research and present it for scrutiny and critique by others in their disciplines. "We are very excited at the tremendous response we've received from students and faculty wanting to participate in SIRC this year," says Deanna Ojennus, assistant professor of chemistry at Whitworth. "This event is an important experience for students to learn how professional dissemination of research occurs, and it is a great opportunity for students to see what their peers have been studying." The conference will include a luncheon for the presenters and their faculty sponsors at noon in the Multipurpose Room of the Hixson Union Building. Following the luncheon, at 12:30 p.m., Andrea Palpant Dilley, a member of the Whitworth Class of 2000 and a documentary writer, director, and producer, will speak. Her talk will be open to the general public, space permitting. Dilley grew up in Kenya, the daughter of Quaker missionaries. She graduated from Whitworth with bachelor's degrees in English literature, writing, and Spanish, and in 2009 she received Whitworth's Young Alumni Award. Her written work has appeared in Rock & Sling, Geez Magazine, and The Utne Reader, as well as in the anthology Jesus Girls: True Tales of Growing up Female and Evangelical (Wipf and Stock). As a documentary director, writer and producer, Dilley has produced content for HDNet, the Hallmark Channel, American Public Television and various PBS stations, and she has shown her work at the Amnesty International Film Festival and the Northwest Asian American Film Festival. Dilley's largest and perhaps best-known project to date is a 60-minute documentary on the Japanese American experience of World War II in the Northwest, produced in collaboration with Whitworth. The program, In Time of War, was broadcast in major markets nationwide through American Public Television. Joining her experience as a practitioner with her interest in theoretical analysis of media, Dilley will attend the University of Texas in the fall to earn a master's degree in media studies. The conference will conclude with a public screening of Dilley's film, In Time of War, at 4 p.m. in the Robinson Teaching Theatre in Weyerhaeuser Hall. Following the screening, a panel discussion will take place featuring Dilley, Whitworth Professor of History Dale Soden, and Whitworth Professor of English Doug Sugano. Deanna Ojennus, assistant professor of chemistry, Whitworth University, (509) 777-4860 or dojennus@whitworth.edu or sirc@whitworth.edu.